Amber Ridge Condos, located on a small dell in the loop of White Cloud Drive, are within a small subdivision of homes and duplexes. Two of these buildings, built in the nineteen-nineties, about 10 years after the others, are called the Amber Ridge Condo subdivision, and they share the land below them, as is normal with condos. Otherwise, Amber Ridge condos for sale are similar in exterior and interior style to their neighboring duplex homes. 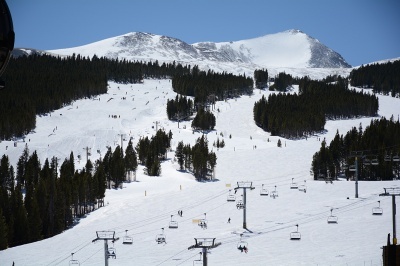 The Amber Ridge condos for sale in Breckenridge are glanced by the sun morning and evening, with incredible views of Peak 10, and across the valley. It’s forested location on a patch of level ground in Warriors Mark West makes it an ideal place to start a hike or ski. It’s part of the incorporated town of Breckenridge. The land around these homes is forested, and feels like an open park. Check out active Amber Ridge condominium listings below, or find out more about these popular condo complexes. From these Amber Ridge condominiums, it’s downhill to the lifts at the base of Peak 9 and in the winter, it’s common to see folks strapping on their skis across the road and heading along a trail off the ridge. Likewise, these skiers come home from Peak 9 via neighborhood trails and skate a few final strokes home. It’s not for beginners, but doesn’t require Olympic skill. Cross-country skiing from the doorstep is just as doable and trails radiate in several directions. 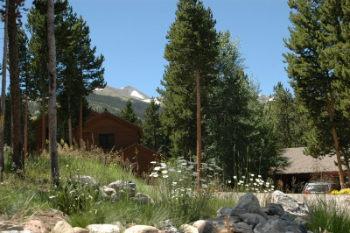 Amber Ridge condos are near the free shuttle stop, which is at the bottom of White Cloud Road, and are quickly accessed from the town of Breckenridge by car. Size: 3174 to 3292 sq. ft.
From the southern most stoplight in Breckenridge, at Boreas Pass Road, take a right and head west on Broken Lance Drive. Follow this drive as it curves around the neighborhood, until the stop sign where it joins White Cloud Drive. Climb White Cloud and after it curves back to the south Amber Ridge will be on the left.